Kuala Lumpur’s Airport Just Got an Upgrade — and it’s a Hotel. Staycation anyone? A hotel inside a mall that's inside an airport. Did we hear that right? Long-haul flights call for patience, energy, and the dreaded layovers, so you had better prepare yourself physically and mentally. Don’t we all just wish we could sleep or rest comfortably with a good meal each time we’re on a layover? 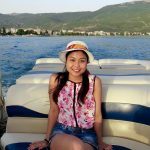 It sounds easy, but difficult to do because no matter how posh the airport looks like, you’re always looking for available seats and guarding your carry-on bags since you’re around complete strangers. But listen up, because KL International Airport is making our lives easier. To be more specific, Aerotel Kuala Lumpur located in Terminal klia2 is making our layovers more enjoyable. You’ll find this hotel inside [email protected] Mall of Terminal klia2, on the landside (public area before security and Immigration clearance). To mark the momentous launch of the hotel, it was jointly officiated by the Founder and CEO of Plaza Premium Group, Mr Song Hoi-see, and Malaysia's Minister of Transport, YB Mr Anthony Loke Siew Fook. The hotel is completely unique not just because it's located in a “shopping mall with an airport”, it also has all the makings of a quick staycation. 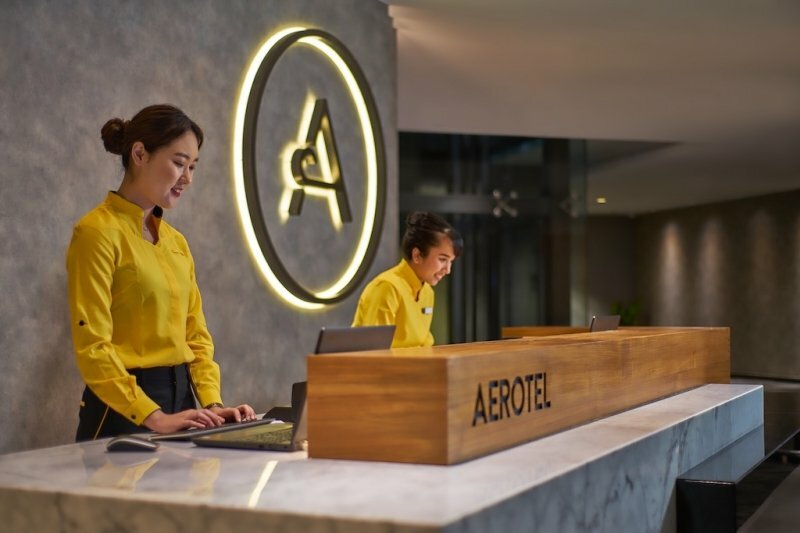 Once you experience an “airport hotel” of this scale, you’ll want to have long layovers and you’ll want to have it in Aerotel Kuala Lumpur! Sleepy and anticipating jetlag? Take a power nap! Or better yet, sleep for hours until you need to fly. 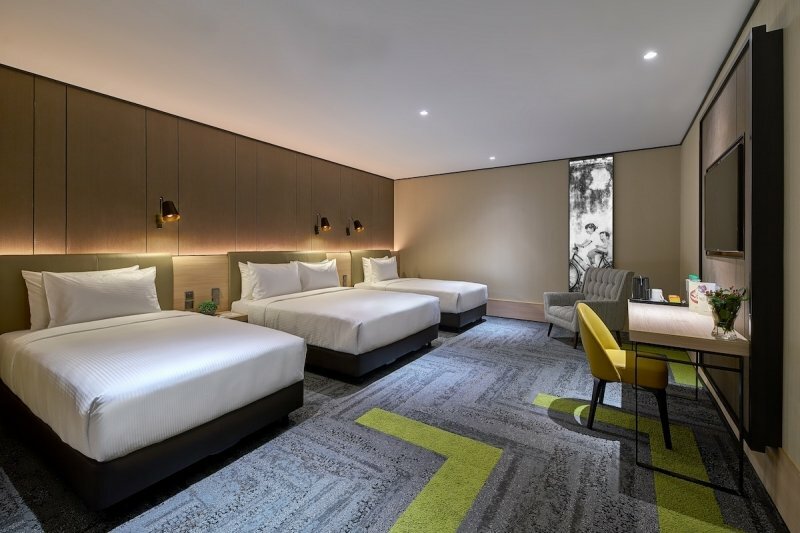 Aerotel Kuala Lumpur has 78 comfortably and thoughtfully-furnished guest rooms for travellers who need some shuteye. Whether you’re travelling alone, with your special someone, or with a big group or family, their rooms can surely accommodate your needs. They have four different rooms, the Solo Plus, Double Plus, Double Squared, and the Family room. All of the rooms come with cosy beddings, soft and hard pillows, hot showers, hair and skin care products, hairdryer, WiFi, 43-inch colour TV, and a coffee and tea making facility. Basically, you’ll get everything you find in a classy hotel in the city. The only difference is, this one’s inside the airport where you can conveniently wait for your flight (and without stress too!). 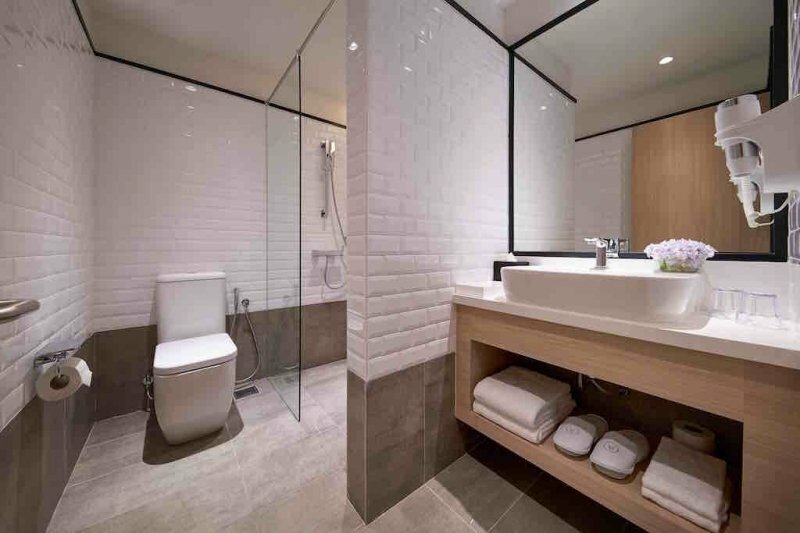 Tip: If you like this hotel so far, check out Aerotel Singapore when you're in the Lion City! Check in at your convenience – and stay for the hours you need. Their check-in time is flexible with stay hours ranging from 3, 6 to 12 hours. 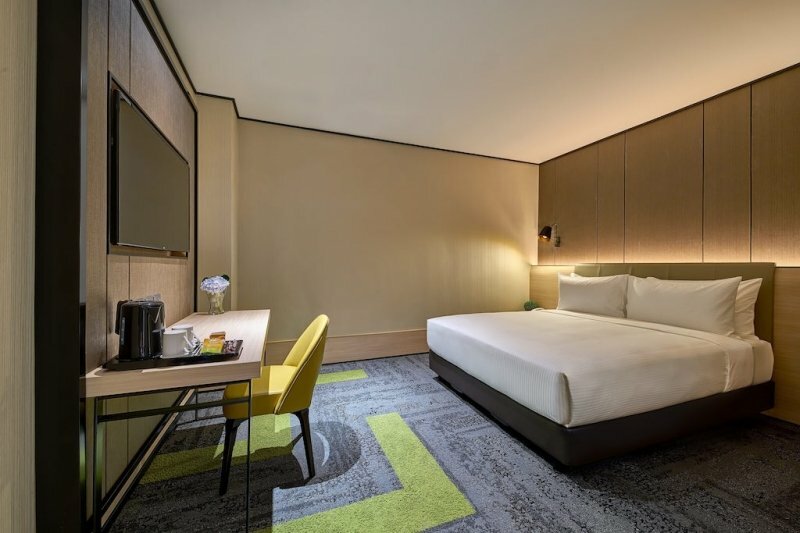 To make the experience even better, walk-in travellers who choose to stay in Aerotel Kuala Lumpur now in its opening year will be treated to a room promo of a 15% discount via [email protected] until 31 December 2018. Easy, comfortable, and practical, now THAT’s a staycation. Note: Room rates for a 6-hour stay start from RM280 (Solo Plus Room), RM364 (Double Plus Room) and RM571 (Double Squared/Family Room). All room rates are quoted in Ringgit Malaysia (MYR) and subject to 6% Service Tax. A Tourism Tax of RM10 nett per room and per stay will be imposed on all non-Malaysian guests, in addition to the quoted room rates. 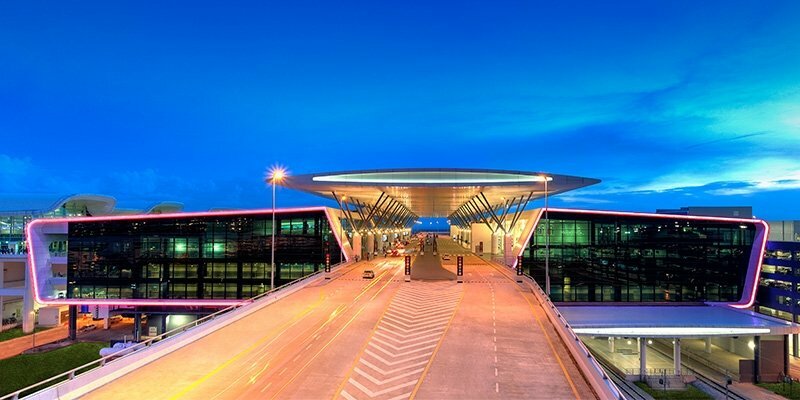 It’s already unlikely to feel so at home in an airport, and it’s even more unlikely to find an elegant and creatively designed airport hotel in your layover. But it’s easy to discover all of these in Aerotel Kuala Lumpur. With the way the hotel is designed and furnished, travelling guests will find the ambience tasteful and calming. Well-appointed in timber, with earthy hued fabrics of green and grey, the interiors are spacious and bathed in warm lights that give visitors a relaxing and cosy atmosphere. You will also find paintings of popular tourists attractions in Malaysia hung on the walls and public areas of the hotel. If you want to stretch your legs outside of your hotel room, just take a walk around its vicinity; enjoy a myriad of choices be it retail therapy or F&B! Dare we say, this is an even better option than just going round and round the duty-free area like what we usually do in other airports. It wouldn’t be a staycation without mouthwatering and world-class cuisine! 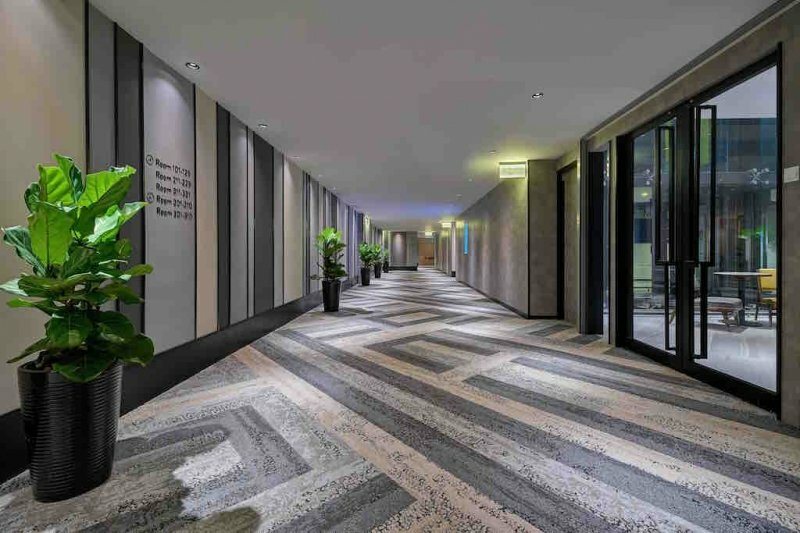 The hotel’s Plaza Premium Lounge, located next to Aerotel Kuala Lumpur, is where travellers can have a lion’s share of great food and beverages. 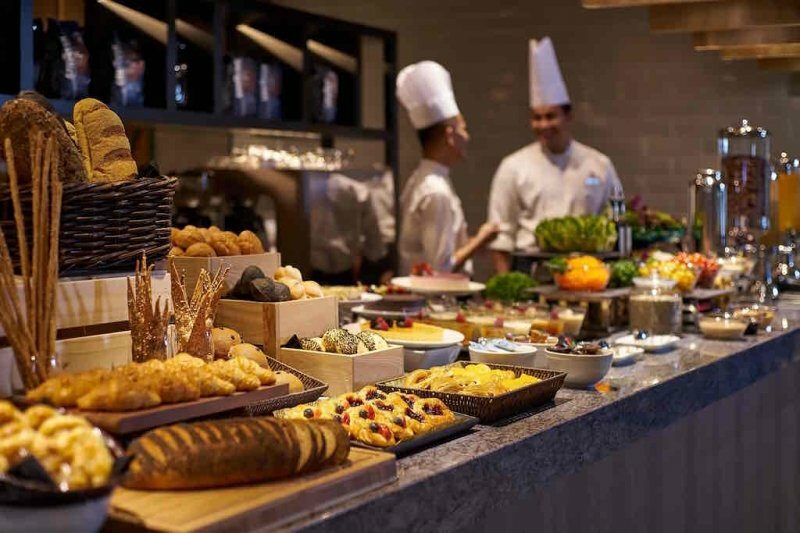 They have a live kitchen with daily cook-to-order offerings for everyone to indulge in; freshly prepared selections such as the signature chicken rice, noodles, sweet and savoury soups, and pasta favourites are the daily showcase. And oh! Those bakery items, pastries and desserts – all made fresh daily from their kitchen! You’ll love them! This lounge is also a great place for travelling friends to start their bonding sessions. Not only can they bond over delicious food, the lounge also has enough space to seat large groups. 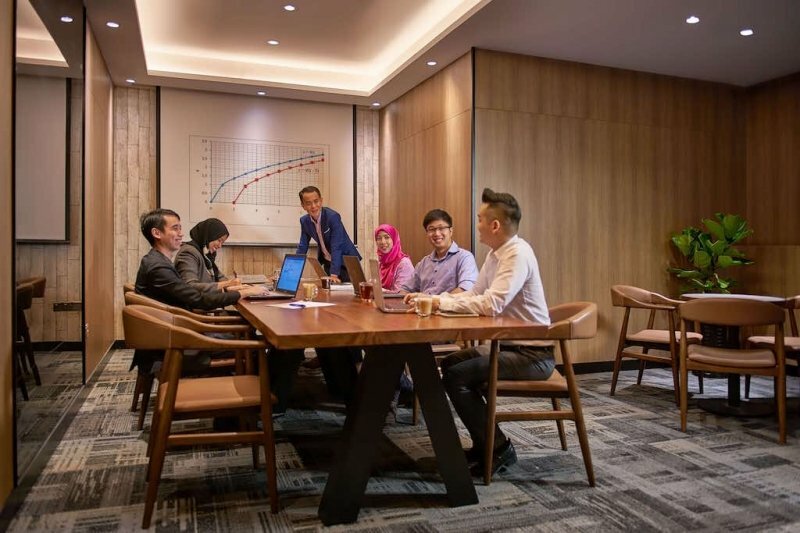 It can actually accommodate more than 100 people and even has meeting facilities like the VIP Room and smaller Meeting Rooms, with one seating up to 22 persons. Your meeting convenes the moment you land! No more hasty, stressful dash to the city for that all important meet! 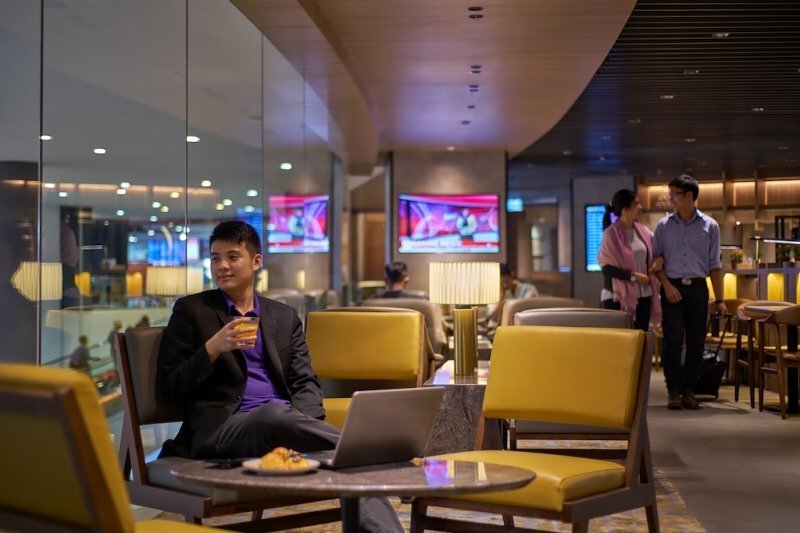 The facilities of the Plaza Premium Lounge is also top-notch, with their ever so comfortable sofas, WiFi, TV, charging sockets, and especially their approachable staff. The best part is, it doesn’t matter if you’re travelling Economy or Business Class, this lounge welcomes everyone. You’ll definitely feel right at home! If you’re done resting your bones and satisfying your culinary cravings, it’s time to try out the hotel bar at Aerotel Kuala Lumpur. The BAR is the only open bar in klia2, and is as comfortable as bars can get with over 40 snug seats made of high stools and cocktail tables. Unwind with your buddies and watch the latest sports game on the big flat screen TV as you drink your pints or sip your cocktails. 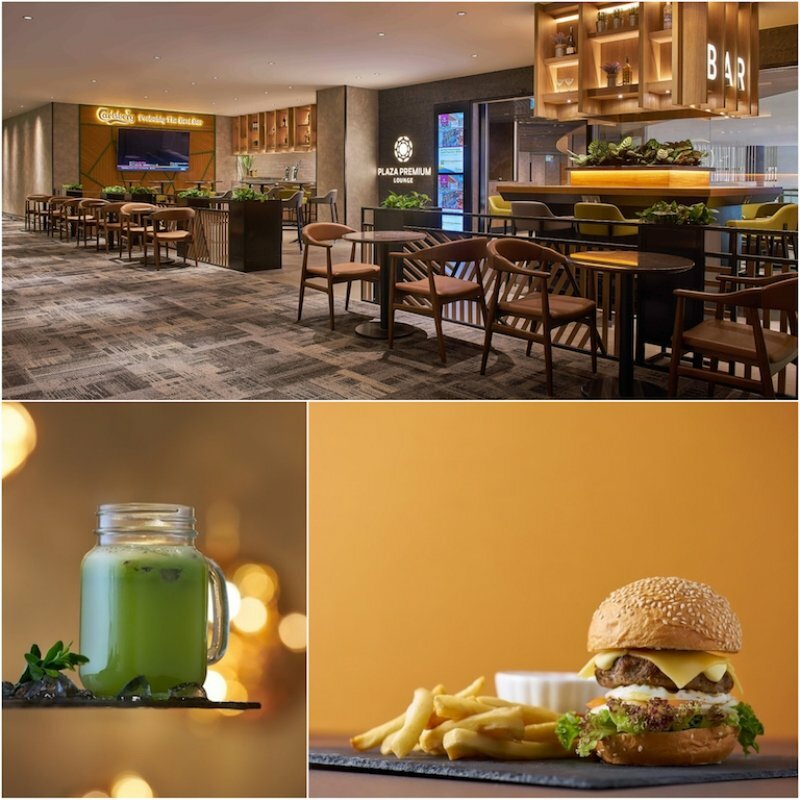 You could even continue your gastronomic adventure from where you left off in Plaza Premium Lounge and order nibblers like burgers, fries, chicken wings, or desserts and pastries from the Bar. And if this isn’t “staycation” enough for you, do what your tourist persona would do — shop. 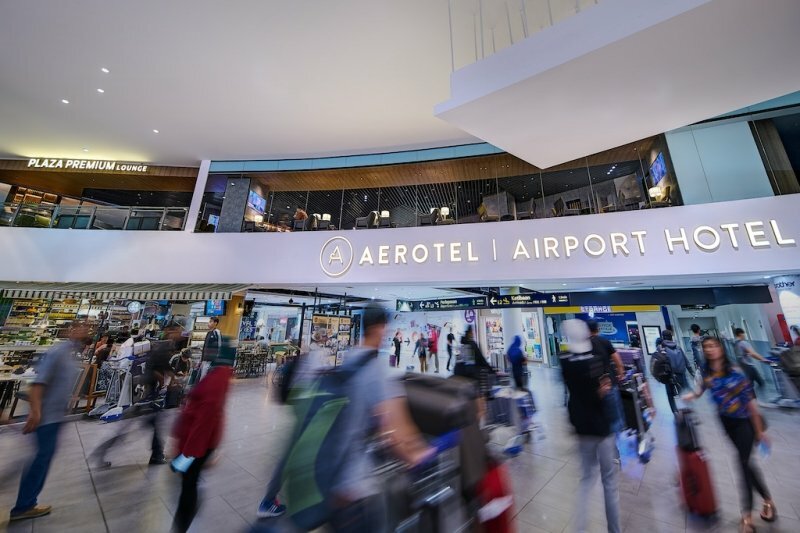 If it has already slipped your mind, Aerotel Kuala Lumpur is located inside a shopping mall, which is inside Terminal klia2 of the Kuala Lumpur International Airport. So you have the whole mall at your doorstep when you stay in the hotel. Go on a retail therapy in [email protected] and discover Malaysia’s local fashion, food, and beauty brands. It’ll definitely give you an eye opener as to what items are unique to Malaysia. Maybe you can start your souvenir shopping while you’re on this layover too. Did you know that [email protected] has regular events for travellers? These include pop-up stores that sell travel items, festive celebration promos, and in-mall bazaars. Remember, don't limit yourself to buying tokens from your travels in your end destination. No one is left out in Aerotel Kuala Lumpur. The hotel has an accommodation for people with special needs, and if that wasn’t thoughtful enough, they provide two kinds of pillows for each room. One is a hard pillow, and the other, soft. We finally found a hotel that acknowledges that not everyone is inclined to fluffy pillows! Besides, a pillow menu is on standby upon request – select from either Lavender, Buckwheat, Latex, Cassia and Memory Foam. Just ask the friendly service team! 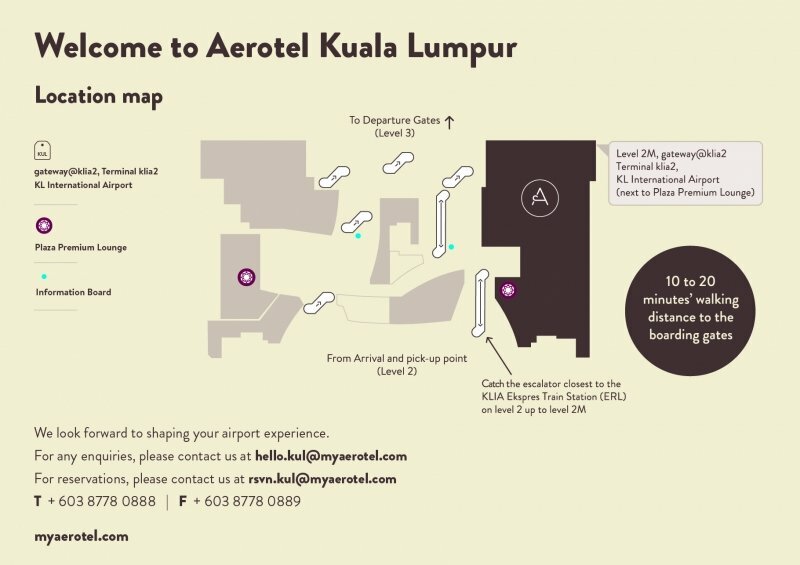 Aerotel Kuala Lumpur is the only hotel in the world located inside a shopping mall and inside an airport. It’s close to the departure and arrival halls, which makes the walk to and from these areas more convenient. It’s impressive just to think of the overall concept, but you’ll have to experience it to really appreciate how the strategic setup works. Aerotel Kuala Lumpur also has the only open-concept bar in [email protected], so if you value spaciousness and booze, you know where to go. Plaza Premium Group has brought premium airport services through their Aerotel hotels around the world, namely Singapore, Abu Dhabi, Muscat, Rio de Janeiro, and Hyderabad. 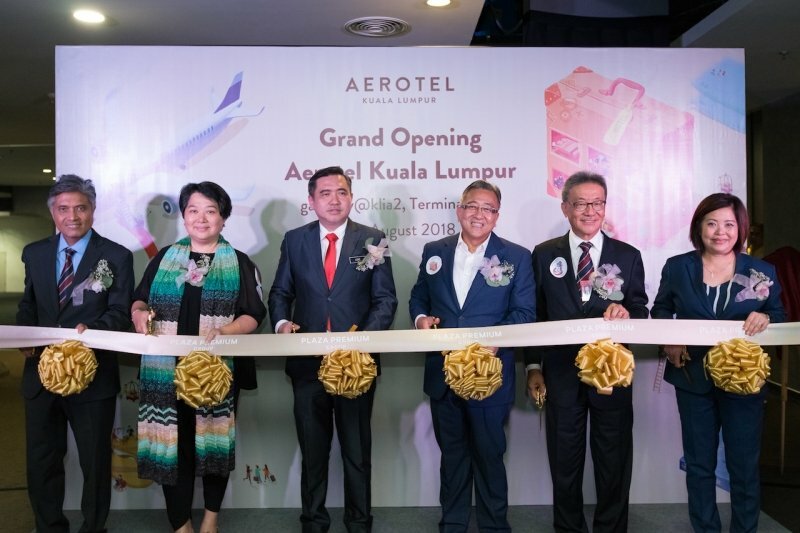 Now, Aerotel Kuala Lumpur in Malaysia is the group’s sixth airport hotel to open. And the way we see it, their executions keep getting better and better! Beat the long wait on your Kuala Lumpur layover and have your own Aerotel Kuala Lumpur airport staycation. It’ll feel almost like a quick weekend vacation at your favourite hotel back home. Everything you need to pass the time is right here, no stress involved! Brought to you by Aerotel Kuala Lumpur.